Once you have selected the Devices to include in the Device List, you are ready to specify the display criteria for each selected Device. Open the Options panel and click on the Device Criteria button. Select a Location and Device. Each Device's display criteria is either based upon its Status or its Value. The default, as shown, is to use its Status. 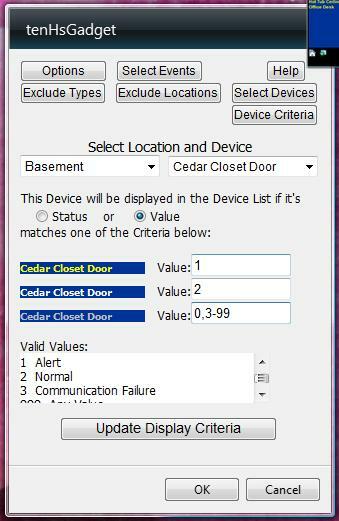 First, select if you want the criteria to be based upon the Device's Status or Value. would be a valid criteria specification. If you specify that the Device's Value should be used in the criteria, a list of valid Values will be shown if the Homeseer Device has Value-Pairs defined for it. After you have specified the criteria for a Device, you MUST CLICK THE Update Display Criteria BUTTON FOR EACH DEVICE IN ORDER TO SAVE YOUR CRITERIA. When you have specified the Criteria for all of your selected Devices, click OK.
By default, when a Device is displayed in the Device List, only the Device Name is shown because of the limited space in the docked gadget. 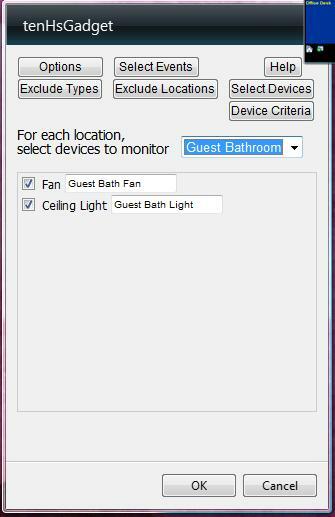 This can lead to confusion if you have multiple Devices named Ceiling Light in different Locations. The Location/Name combination creates a unique Homeseer Device, but just displaying the Device Name can lead to confusion. There may also be Device Names that are too large to display in the docked gadget. To deal with these issues, tenHsGadget allows you to specify a Display String for each Device and Event. Open the Options panel and click on Select Devices. 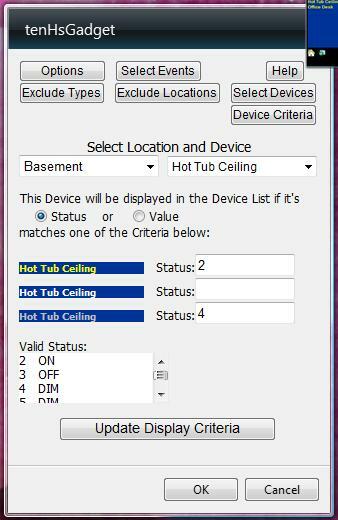 Select a Location to display a list of Devices. You may specify a Display String for each Device. Similarly, you may specify a Display String for each Event by clicking of the Select Events button.